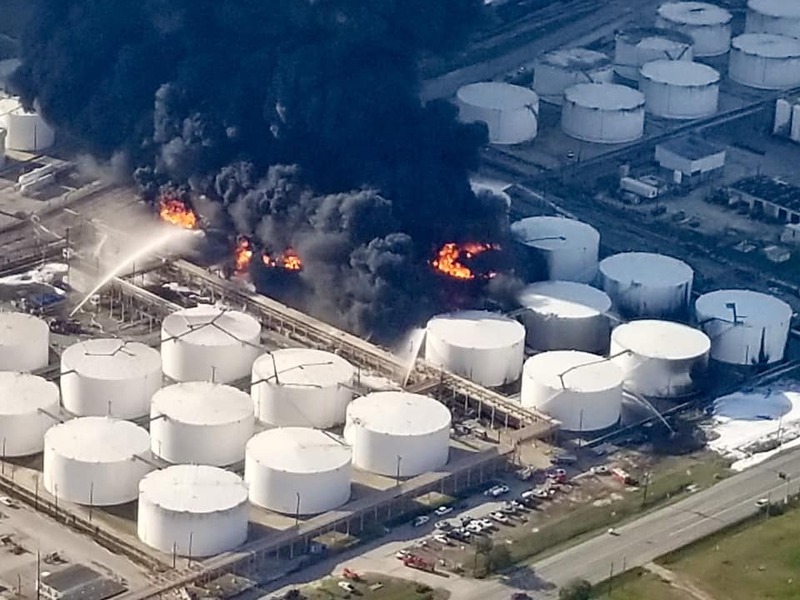 On Sunday, March 17, a leak at the Intercontinental Terminals Company (ITC) petrochemical plant in Houston caused a fire large enough to engulf at least nine storage tanks holding gasoline components with high levels of the carcinogen benzene. The fire created a huge plume of thick black smoke that smothered the city for several days. Without an adequate response plan in place to control the blaze, the fire re-ignited days later. To make matters worse, a toxic run-off, created by chemical leaks from the plant mixed with fluids used to quench the fire, flowed into Galveston Bay. A large part of the Houston Ship Channel, the second largest port in the U.S., was closed for days, putting thousands out of work and possibly resulting in damages of over $1 billion. This is a man-made catastrophe of huge proportions, created by a system that puts profits of corporations above the environment and local communities – to ITC, we’re just externalities. The ITC facility, about 20 miles east of Downtown Houston, has a track record of environmental and safety violations. However, they were only subject to relatively small fines by state regulators. Too often, industry lobbyists write industry regulations, which are then enacted by corporate politicians elected with campaign cash from the same industries. To make matters worse, regulators tasked with enforcing these laws often have a cozy relationship with the industry they are supposed to police, resulting in lax enforcement. Houston residents are outraged, expressing anger and concern at town halls and in the media. However, there does not appear to be the mood for protests. Socialist Alternative in Houston argues that protest and demonstrations are important for fighting back against the destruction of our communities and city by the big corporations like ITC. The fire has also cast a cloud over Houston Mayor Sylvester Turner’s plan to lay off hundreds of firefighters in response to the mandate for firefighters to have pay equity with police officers. While the Houston Fire Department may not have been directly involved with extinguishing the blaze, it is a stark reminder (and perhaps warning) of the high degree of danger created by the petrochemical industry and the need for planned, thorough disaster response. Rather than shrinking the fire department, Houston and surrounding cities should be strengthening their ability to respond to chemical fires and other serious public dangers. Furthermore, people in neighborhoods near the plant reported health effects shortly after the fire began. Public health facilities were hastily prepared as the fire still raged, and the response was slow as well as completely inadequate. There are still huge concerns about the levels of benzene and other toxic chemicals released during the fire and in its aftermath. It is clear that public health efforts in Houston and surrounding areas are dangerously weak and must be improved. The ITC fire shows just a part of the danger of society’s reliance on petrochemicals. Across the country, neighborhoods and entire cities are environmental “sacrifice zones” suffering from great environmental pollution, considered acceptable by corporate executives and the wider capitalist system but in no way acceptable to the working people and families suffering its effects. The petrochemical industry is also a major contributor to climate change, the effects of which are already felt in more severe, unusual weather patterns. These effects are anticipated to intensify over the next several decades. WIthout drastic decreases in carbon dioxide emissions, these effects could be catastrophic for human civilization. By the logic of the capitalist system, profitability trumps any concerns over safety or the environment. ITC and other petrochemical companies routinely buy off politicians through a rotten system of campaign fundraising, and entice regulators with the promise of cushy jobs if they turn a blind eye to the companies’ health and environmental violations. ITC executives and shareholders can reap the benefits of their facilities without having to deal with the costs of cleanup or the disastrous environmental and health effects. Furthermore, establishment politicians keep corporate tax bills low and skimp on things like emergency response and public health, all in an effort to create a “business friendly” environment for corporations while pushing as much of the cost of pollution onto the public. The disastrous effects of the ITC fire and the enormous changes wrought by climate change both urge immediate, serious and coordinated action. A Green New Deal, like that proposed by Alexandria Ocasio-Cortez and others, would be an excellent step toward limiting and mitigating the effects of climate change. Further, it could create a green energy grid, built by current energy industry workers, to lessen our reliance on fossil fuels. An important step alongside the Green New Deal is bringing these polluting energy corporations under the democratic control of workers and our communities, with democratic decision making. We can then use their assets to pay for the cleanup, health care for people made ill by the disaster, and to send a strong message to other polluting companies. But the petrochemical and other polluting corporations depend on their ability to endanger the public to turn a profit. We should expect these corporations to fight tooth and nail against any efforts to curb their ability to pollute. We should also not have any illusions in the corporate politicians and judges who have enabled this toxic style of capitalism to grow. Instead, affected communities should join with petrochemical and other workers to pack hearings and meetings, stage mass protests, and if needed engage in workplace actions like strikes. Ultimately, even larger corporations like Marathon, Shell, and others pose an even bigger threat to the health and safety of the world. If a relatively small company like ITC can pollute the entire city’s air and shut down the second biggest U.S. port all on its own, then the possible disaster created by much larger companies is a significant threat. In the short time since the fire, an explosion at a nearby chemical plant killed one worker and released more toxins into the community. Rather than wait for yet another disaster to strike we should learn from the mistakes that led to the ITC disaster instead of waiting on an even bigger disaster in the petrochemical industry and make them subject to democratic control. Bring the biggest petrochemical companies into public ownership to fund the transfer to a sustainable economy.